Alex Cora is a Puerto Rican professional baseball manager and former infielder. He is the current manager for the Boston Red Sox of Major League Baseball. He played college baseball at the University of Miami, and played in MLB for the Los Angeles Dodgers, Cleveland Indians, Boston Red Sox, New York Mets, Texas Rangers, and Washington Nationals from 1998 until 2011. In 2018, he became manager of the Boston Red Sox. 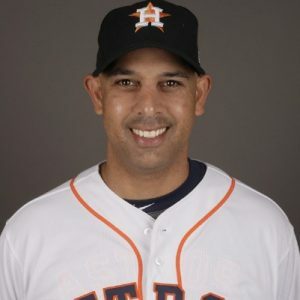 Born José Alexander Cora on October 18, 1975 in Caguas, Puerto Rico, to Iris Amaro and José Manuel Cora, his older brother Joey Cora is a former MLB utility player and current coach. He was drafted by the Minnesota Twins in the 12th round of the 1993 MLB draft while he was in high school. He made his Major League debut against his brother, Joey. He is married to Nilda Cora. He has four children: Camila, Jeriel, and twin boys Xander and Isander. *He played college baseball at the University of Miami. *He was inducted into the University of Miami Sports Hall of Fame in 2006. *He currently serves as a manager of the Boston Red Sox of Major League Baseball. *He was a baseball analyst for ESPN before becoming a coach and manager.